One Palestinian was killed, homes were demolished and dozens more were arrested on Tuesday amid an intensifying Israeli army crackdown in West Bank areas following the disappearance of three Israeli settlers. The latest demolition took place in the town of Idhna, near Hebron, according to local sources. The house belonged to Muhammad Hussein Farajallah and housed a family of six, reported Ma’an news agency. Ma’an quoted a spokesman for Israel’s civil administration who revealed little but said the house was built “illegally”. Meanwhile, the Israeli army expanded an arrest campaign of Palestinians from the Hebron region in the southern West Bank all the way to Nablus in the north, with 41 Palestinians arrested since Monday. Most of those held are reported to be affiliated with the Islamic group Hamas, and approximately half of the arrests took place in the Nablus region. The Israeli daily newspaper Haaretz reported that the operation involved about 1,000 soldiers from the Nahal infantry brigade, “who raided, among other locations, the Balata refugee camp and the nearby town of Awarta”. The force allegedly uncovered a variety of weapons, including pistols, explosives, grenades and ammunition. The disappearances of three Jewish settlers, Gilad Shaer (16), Naftali Frenkel (16) and Eyal Ifrah (19) is being treated as a kidnapping orchestrated by Palestinian militants. Hamas, whose members are the main target of the Israeli military campaign, deny any responsibility. A Hamas spokesperson in Gaza described Israeli allegations as “stupid”. The Israeli response has included the arrest of the speaker of the Palestinian parliament. Aziz Dweik, also member of the Islamist group Hamas, was the latest in nearly 200 arrests that have taken place of Palestinians in the West Bank. The three settler youths were allegedly kidnapped last Thursday while hitchhiking between Bethlehem and Hebron. The intensive Israeli military operations in various parts of the West Bank resulted in clashes between locals and Israeli army troops. 19-year-old Palestinian, Ahmad Arafat, was shot dead near Ramallah early on Monday during one of these clashes. Palestinian medical and security sources said Arafat was shot in the chest during clashes with Israeli army forces in the Jalazoun refugee camp. The Palestinian security sources could not immediately say whether the army had intended on arresting Arafat. They noted he had been released from Israeli prison a week ago. Amani Sarahna, spokeswoman for the Ramallah-based Palestinian Prisoners Club, told AFP 60 people were detained overnight but said the wave of arrests was “still ongoing” in the southern West Bank city of Hebron. “IDF efforts are focused on enabling operational capabilities, enhancing intelligence and influencing those that participated, are involved or have knowledge of the whereabouts” of the missing settlers,” said a statement from Lieutenant Colonel Peter Lerner, the army’s official spokesman. On Sunday, Israeli Prime Minister Benjamin Netanyahu accused militants from Hamas of kidnapping three Israeli teenagers in the West Bank. “This morning I can say what I could not say yesterday before the broad wave of arrests of Hamas people in Judea and Samaria,” he said, using the biblical term for the West Bank. “Those who carried out the kidnapping of our youngsters are Hamas people – the same Hamas with whom Abu Mazen (PA President Mahmoud Abbas) has forged a unity government, which has very serious implications,” he said. Netanyahu was speaking at the start of a special session of the weekly cabinet meeting held at the defence ministry in Tel Aviv. Hamas spokesperson Sami Abu Zuhri was quick to dismiss the allegations, saying they were “stupid” and “intelligence-driven”. The disappearance of the three teenagers came 10 days after a new Palestinian unity government of technocrats was sworn in, following a reconciliation agreement between leaders in the West Bank and Hamas in a move that has enraged Israel. Blockades were also put up throughout much of the West Bank, with reports emerging that several Palestinian towns are on lockdown. 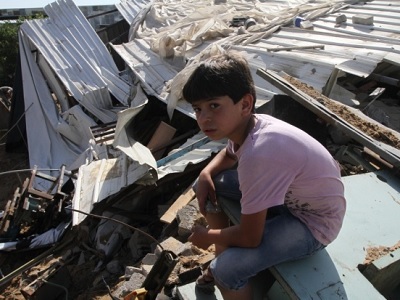 The Israeli military meanwhile continued to pound Gaza from the air, with eight strikes happening overnight. However, authorities continued to insist that the move was in response to rocket attacks that happened on Saturday and refused to link the operation to the kidnapping. Eyewitnesses in Gaza told Middle East Eye that the Israeli aerial bombardment continued for the third night into Tuesday, targeting various parts of the strip. Some of the targets included training camps for Palestinian groups, but also some civilian properties. Most of the raids happen late at night. Ibhraim Mhessin of the Palestinian police said that a total of 18 targets have been bombed by Israel, using Apaches and F-16 jets. Israel has said it holds Abbas responsible for the safe return of the three settlers, with Netanyahu phoning him to demand his help in search efforts – their first direct political contact since 2012. At a meeting of the Israeli security cabinet on Monday, ministers decided to expand moves against Hamas in order to damage its political and social infrastructure in the West Bank, officials said. “As long as our boys remain abducted, Hamas will feel pursued, paralysed and threatened,” said Lieutenant Peter Lerner, the military’s official spokesman. “We are committed to resolving the kidnapping and debilitating Hamas terrorist capacities, its infrastructure and its recruiting institutions,” he said in a statement. Israeli ministers were reportedly meeting again on Tuesday. Economy Minister Naftali Bennett, who was at the meeting, told the radio Israel had decided to “dramatically” change its approach to the Islamist movement. Writing in the top-selling Yediot Aharonot, Alex Fishman said the kidnapping had created a “one-time operational opportunity” which Israel would use “to castrate” Hamas and suppress its “strongholds in Palestinian Authority territory to the greatest extent possible”. Pundits said Israel was also seeking to bring about the collapse of a newly-formed Palestinian unity government backed by Hamas, the first fruits of a reconciliation deal between rival leaders in the West Bank and Gaza which has been furiously denounced by the Netanyahu government. “The purpose of the Israeli actions … is to drive a wedge between the Palestinian Authority and Hamas, and stop the reconciliation process that began some two months ago,” wrote Amos Harel in Haaretz newspaper. By crushing Hamas’s infrastructure, it would weaken the movement ahead of Palestinian elections which under the unity deal are supposed to take place before the end of the year, Fishman said. “Removing the political leadership from the West Bank is supposed to weaken Hamas in advance of the Palestinian presidential elections,” he said. But as the hunt entered its fifth day, commentators voiced concern about growing reports of clashes around the West Bank, sparking fears that an already tense situation could rapidly escalate. In addition to the killing in the Jalazoun camp north of Ramallah, another Palestinian was seriously wounded. Israeli military radio said that he was trying to infiltrate a Jewish settlement in the same area. The situation is also escalated in Gaza, despite Israel’s insistence the air strikes were not linked to the alleged kidnapping. Meanwhile, several rockets originating from Gaza reportedly landed in southern Israel without resulting in any casualties.